New Delhi : It is true that many of us are careless about caring our environment. Despite knowing the fact that throwing plastic into landfills contaminates the soil and groundwater, affects marine animals we keep on doing so. This cruel action of human beings has led to the death of a young whale in the Philippines. 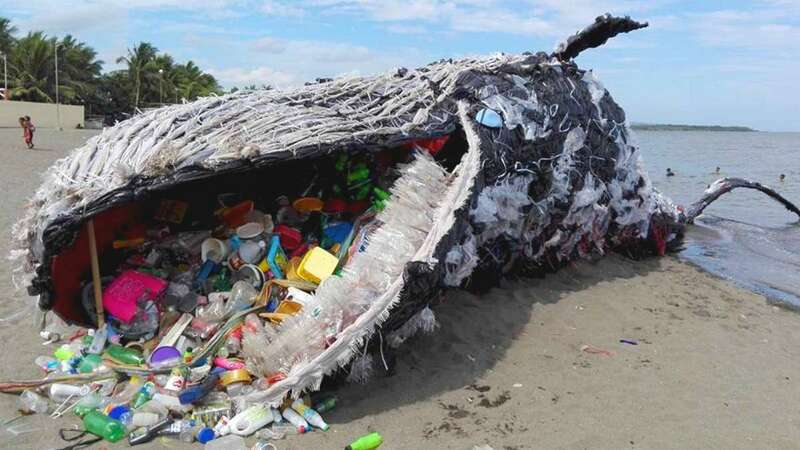 The young whale is found to have died from 40kg of plastic bags in its stomach. Marine biologists and volunteers from the D’ Bone Collector Museum in Davao City, in the Philippine island of Mindanao performed an autopsy and were shocked to discover the brutal cause of death for the young curvier beaked whale, which washed ashore last week. In a Facebook page, the museum said they uncovered “40 kilos of plastic bags, including 16 rice sacks. 4 banana plantation style bags and multiple shopping bags” in the whale’s stomach. Images from the autopsy showed endless piles of rubbish being extracted from the inside of the animal, who is said to have died from “gastric shock” after ingesting all the plastic. A 2017 report by Ocean Conservancy stated that China, Indonesia, the Philippines, Thailand, and Vietnam have been dumping more plastic into the ocean than the rest of the world combined. In June 2018, a whale died in southern Thailand after swallowing more than 80 plastic bags, which weighed up to 8kg (18lb) in the creature’s stomach, and marine biologists estimate around300 marine animals including pilot whales, sea turtles and dolphins, perished each year in Thai waters after ingesting plastic.